Babablue Jewelry Designs – Honor Your Being and the Environment. Adorn yourself with Sustainable Art. Honor Your Being and the Environment. Adorn yourself with Sustainable Art. Born and raised in the San Francisco Bay Area, Barbara has embraced the transformation of her environment into an area of multicultural diversity. Barbara believes in the respect and importance of the environment, of cultures and of the past. Her One-Of-A-kind Jewelry pieces embody these aspects. BabaBlue Jewelry is today’s approach for the contemporary woman to feel exquisite and special while adorning herself in jewelry that celebrates the sustaining of our environment and cultures. 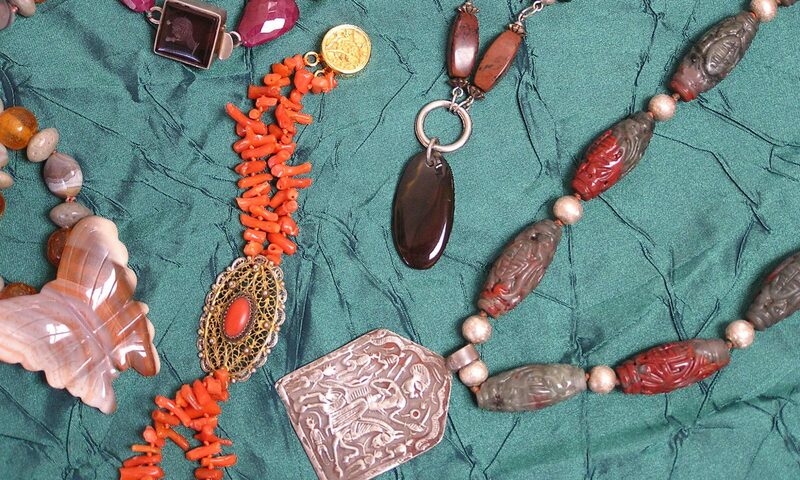 Barbara has been designing and making jewelry throughout her life. She has been a Sustainable artist from the start, long before it became popular. Her jewelry pieces combine antique, vintage, rare and unusual components. Exquisite and natural stones, wood, crystals, antique glass and ceramic all enhance each piece of BabaBlue Jewelry. She is known for her use of color and texture. Sterling silver, copper, brass 14kt and 18kt gold are the metals used in her jewelry pieces. Barbara’s keen eye and her design ability are well known. Her sophisticated and elegant creativity are evident in each piece of BabaBlue Jewelry. Barbara’s following is loyal and the anticipation of each new collection is awaited with excitement. Many of Barbara’s clients have asked for assistance with their interior home decoration. Barbara believes a home should be the place where an individual feels at ease, special and content. The home should reflect the client’s personality, preferences and living style. The “decorated look” is not found in Barbara’s home designs. She does not gravitate to manufactured furniture and accessories. Instead, Barbara focuses on fair trade accessories, handmade furniture and vintage and antique furniture. She prefers dealing with privately owned businesses and artists. Her eye for color, texture and placement are unsurpassed, and she gives each client her undivided attention. Barbara is passionate about all aspects of design. It is part of her essence. A home is your own personal and private environment – an extension of your self. Homes should have aspects of whimsy to make you smile. Barbara can be contacted via e-mail at barbara@babablue.com. Many of Barbara’s clients have asked for assistance with their interior home decoration. Barbara believes a home should be the place where an individual feels at ease, special and content. © Copyright 2018 by Barbara Cianos DBA Babablue and Babablue Jewelry Designs. All Rights Reserved.